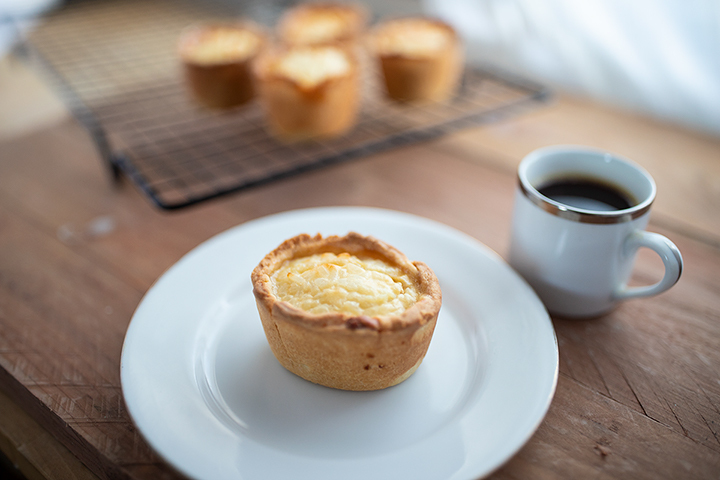 One of the discoveries of spending a week in Tuscany was the budino di riso - little rice pudding tarts - that were on sale in some of the cafes. They were tasty, a hit of vanilla rice pudding with a little hint of lemon. And they immediately made me think that these could easily be adapted in a number of ways. When I think back to the rice pudding I would eat as a kid it would often be accompanied by a dollop of apple sauce. I would stir it all in, and enjoy this appley rice goodness. So it was natural for me to wonder if these could work with a layer of apple. Also, because I’d tried a couple of times the popular Malaysian breakfast Nasi Lemak - where rice is cooked in coconut milk, it occurred to me that it could be an interesting variation in its own right. So I came up with these - coconut rice pudding and caramel apple tarts. It took a couple of goes to get them right, but I was pretty pleased with where they ended up. Delicious rice pudding with a hint of coconut, underpinned by the extra texture and caramel flavoured apples. Yum! These are deep tarts - I used a lovely Friand tin 4cm deep that I bought specifically for the purpose. But you want lots of filling and relatively thin pastry. For the pastry, I used half and half ordinary all-purpose flour and a specialist French strong patisserie flour. This had been recommended to me as being particularly effective for pastry, but the specialist flour is considerably more expensive, and you can happily just use plain flour if you can’t, or would rather not, get it. First make the pastry. Combine the two flours, salt and the icing sugar and mix thoroughly. Add the fats, cold from the refrigerator, and rub the fat into the flour until it achieves the consistency of breadcrumbs, working fast and trying to keep the whole mix cool. Add the egg and milk and mix together with a knife until coming together. Then use your hands to bring it together into a relatively smooth dough, cover with clingfilm and leave to rest in the fridge - ideally for a couple of hours. Once it’s rested in the fridge, roll out the pastry to 3/32 in thickness. Yes, that’s rather specific! I use dough thickness rails set to those thickness. My first version was 1/8 inch - and that seemed too thick for tarts this size. The slightly thinner ones were just right. But obviously if you’re happy to do “thin-but-not-too-thin” on instinct, go for it. Cut the pastry into circles large enough to fold into the tins. Smooth them out, leaving a small overlap of pastry at the top of the moulds. Ideally, you should place these in the fridge and leave overnight to chill. When ready to fill, peel, core and chop the three dessert apples into medium sized chunks and cook gently in water sweetened with a couple of tablespoons of caster sugar for five to ten minutes - until slightly softened but not falling apart. Drain and reserve. Make a medium caramel by placing 4 tablespoons of caster sugar in a pan and heating over a medium heat. As the sugar dissolves, you can swirl it around a little to ensure all the sugar dissolves, but don’t stir it. Gently and carefully cook to a medium caramel - light brown, not too dark. Once it’s hit the right spot, add the butter (it may well spit, so be a little careful) and stir until it’s fully melted in. Taste, and if you took it a little too far (so it will have a slightly bitter undertone) you can add a little sugar. Once you’re happy with it, pour it into the apples and mix them thoroughly together. Put to one side. Cook the rice in a pan with the coconut milk, stirring to make sure it doesn’t catch on the bottom. Once it’s fully cooked (about twenty minutes), allow to cool slightly and then add the butter and stir until its fully melted. Allow to cool a little more, then add the sugar, vanilla essence and the eggs, mixing them all together. Put to one side and allow to cool completely. While it’s cooling, preheat the oven to 180ºC / 160ºC fan oven. Put in a couple of teaspoonfuls of the apple mixture into the bottom of the tarts. Then cover with the rice pudding. It doesn’t need to come all the way to the top of the pastry cases. Bake in the oven for 25-30 minutes or until golden brown on the top. Allow to cool before removing from the tin. Traditional Budino Di Riso would have a little icing sugar dusting on top, but they don’t need it in my view because of the additional sweetness of the apples. The finished tarts will keep for a couple of days in the fridge, or they can be frozen. (If you decide to both freeze AND add a dusting of icing sugar, freeze without the sugar and then dust them just before serving once they’ve defrosted). There’s not really any obvious waste from this recipe.